Hey all! I’m at Vancouver International Airport and I’m looking forward to getting home and scrubbing my scalp (and seeing The Hubby, my parents, the fam and my fish). I’ve realized that washing my hair once a week is a necessary evil in the winter. Now that spring is finally here (woo hoo!) I’m going to go back to washing it twice a week. That’s the only way my scalp remains happy. I spent the last four days in Edmonton, Alberta and the very lovely Vancouver, British Columbia. During my travels, I didn’t see very many curlies — a couple here and there, but it’s definitely a much smaller natural hair scene here than it is in Toronto. Edmonton was pretty dry — I can tell that being a naturalista would be more problematic in that city. It’s so far north and the cold weather (it snowed on Thursday) would wreak all types of havoc on my poor kinks. And I wasn’t as good with the moisturizing as I should have been. Vancouver is temperate — the weather was nice and it seems like it would be a more humid city just because of the proximity of it from the Pacific Ocean. I was planning to rock a twist out to my meeting on Friday, but there was a horrible time change mix up and I ended running to my meeting, worried about being late. I thought it started at 11 am Pacific time. Well, it started at 8 am Pacific time. The Lord was on my side because a voice kept telling me to get my lazy backside out of the very warm and very comfy bed I was in. Thank goodness I did. Do you know how EMBARRASSED I would have been to have missed the very meeting that my company sent me to Vancouver to attend? Guy. I would have DIED with embarrassment. So, cute hair styling had to wait until I got back to the hotel room Friday mid-morning. 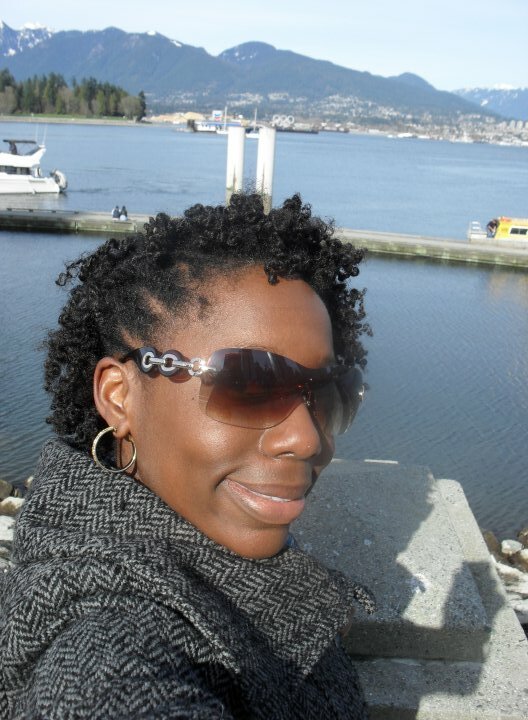 I untwisted and later on in the afternoon, I explored Vancouver. Unfortunately, I didn’t have the opportunity to do too much exploring in Edmonton because I didn’t have enough time and downtown was relatively quiet. I did have an opportunity to have dinner with an old friend — that was great! 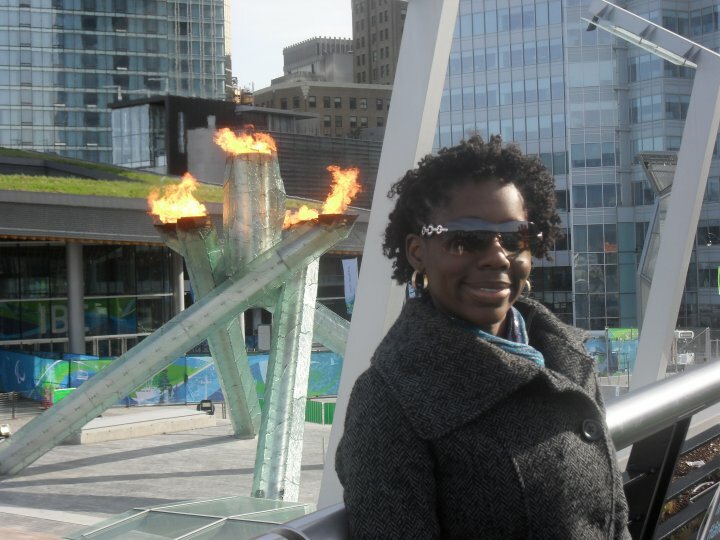 That's me posing beside the Olympic cauldron -- how cool! The Canadian Rockies in the background. If I had the money (Vancouver is EXPENSIVE) I would fully buy a condo here. It's stunning. Oh! BTW, doesn't my hair look cute?